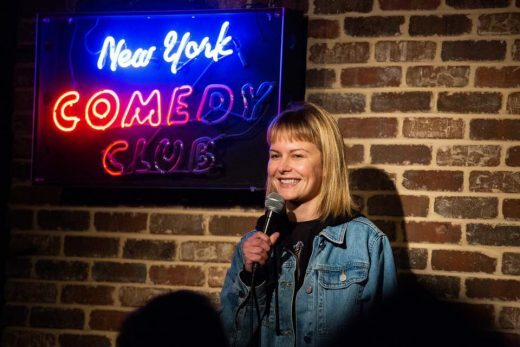 We met up with Rosebud Baker at one of her sold-out NYC comedy clubs shows at the New York Comedy Club in Midtown. I was a writer for online publications, I was a nanny, I taught yoga, worked at a dog behavior training center, and I worked (sporadically) as an actor in NYC in some off-broadway theater and indie films. I didn’t even know, I just became one. When I started I was just having a really bad year and had no pride left. When I started doing mics I was considering becoming a dog trainer or a social worker… I was told I would be terrible at both of those things, and a friend suggested I start doing comedy. I love performing at clubs, and Knitting Factory in Brooklyn, Dynasty Typewriter in Los Angeles, and bar shows around the city are always a fun toss-up. Anybody who learned it on YouTube or Instagram. I average about two shows a night, so 14-16 times a week. But the challenge in NYC is actually working smart, and not just hard. Love New York Comedy Club, and the pop up shows that The Stand is doing around the city at Rockwood Music Hall, and ACE Hotel. Looking forward to seeing their new club when it opens. I can’t answer this question without sounding pretentious so I will decline. Lately, I’m talking about how both my cat and then my dog- died this year -and I had a 5-year long relationship end. I also started sleeping with a DJ, which is somehow worse than all three of those things. I read every book I could about joke writing, and I would watch specials and transcribe jokes to label the setups and punchlines so I could figure out what the anatomy of a joke looked like. I still do that when I feel lost, but now I’m trying to learn how to just talk without hiding behind the security of a joke. I think the best standup combine their writing with an ability to just be their natural, spontaneous selves. Jokes are hard to write but once you know how to do that there’s very little risk involved. Nothing. I usually end up threatening to assault someone. I just started making money doing it and I was like “oh, I guess this is real now.” I was born kind of funny, but I don’t think you have to be born funny to get good at standup.